For other pages with the name Zero, see Zero (disambiguation). Samus and Zero Suit Samus using Zero Laser. Zero Laser (ゼロレーザー, Zero Laser) is Samus' and Zero Suit Samus' Final Smash. The Zero Laser in Brawl. Samus charges her arm cannon and fires a large beam of energy that deals a high amount of damage. The Zero Laser also passes through characters and portions of stages. In Brawl, after firing the beam, Samus's Power Suit is "damaged" and falls off of Samus's body, transforming her into Zero Suit Samus. After the beam has been fired and the Power Suit removed, the damaged pieces of the suit can be picked up and thrown as items by any player. The items have very high knockback and decent damage, but, like any other item, they also can be picked up by opponents and thrown back at Zero Suit Samus or others. Zero Laser lasts a total of about 4 seconds. The move's damage varies depending on how long a character is caught in the beam, ranging from 40-78% damage. While not necessarily a one-hit KO, if used near the edge of a stage the laser can push opponents past the blast line, or close enough that the final burst from the attack will do so. While Samus is using the attack, she and the laser itself have a vacuum effect. Opponents behind Samus will be sucked into the line of fire, and opponents above the laser will also be sucked in. Zero Laser can also be angled slightly up or slightly down by tilting the control stick in the desired direction, though this does not have much of an effect on the laser's area of effect and cannot be moved above approximately a 30 degree angle. The transformation into Zero Suit Samus takes quite a while, and thus is easily punished. Even characters KO'd by the Final Smash are often able to return to the stage and attack as the transformation finishes. It is also possible for an opponent to dodge the move by being behind Samus during the attack, again allowing them to attack Samus as soon as the laser stops. Finishing the Final Smash in mid-air does not put Samus (or rather, Zero Suit Samus) into a helpless state; however, she will fall for quite some time until all her suit pieces fall off. If she is not above a platform, this is often enough to KO her. Should Samus be falling off the stage, activating the Final Smash will not stop her from falling. If Samus activates the laser while falling off the stage, she will continue to fall until she actually fires the laser. If Samus reaches the blast line, she will be KO'd. The change to Zero Suit Samus will still occur. Since the move doesn't engulf the entire screen and only a horizontal strip, some prefer to jump and then use the Zero Laser to maximize its area of effect. The reasoning behind this is that a shot fired on the ground will KO characters who are standing on the ground, but a shot that's fired even a short range above the ground will hit characters who are on the ground and characters who are a bit higher or trying to be able to stay above its range. As demonstrated in the Tokyo vs Kyoto match, Zero Laser's effect was slightly changed in the released game's version; it lasted 2 seconds longer than what it currently is. In Super Smash Bros. 4 and Super Smash Bros. Ultimate, Samus does not transform into Zero Suit Samus after the laser is shot, as Zero Suit Samus is a completely separate character in these games. The laser is thinner than before, but it now fires faster. Samus's Echo Fighter in Ultimate, Dark Samus, has a functionally identical Final Smash called Phazon Laser. 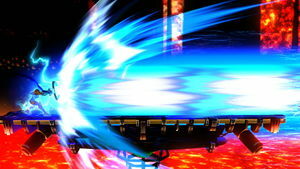 A glitch can be performed with this Final Smash that makes it so Samus doesn't transform to Zero Suit Samus, as well as the Laser resulting in a non-damaging energy ball. Performing it is the same as performing the other regenerating terrain glitches. In Ultimate, Zero Suit Samus revived Zero Laser as her new Final Smash. Zero Suit rises into the air, then appears in the background atop her Gunship, wearing her Power Suit. A player-controlled crosshair then appears, and when the attack button is pressed, the now-suited Samus begins firing her Zero Laser with an area roughly equal to that of the crosshair. Like the Zero Laser used by the playable suited Samus, it hits multiple times and builds up damage. At the end of the move, there is a brief pause, then one final burst is fired with enough power to launch opponents. Once the move concludes, Samus reverts to her Zero Suit; unlike with Power Suit Samus in Brawl, she does not retain her Power Suit for gameplay after use. The move is unique to Smash Bros. Originally, Samus's Power Suit is somehow lost in a crash when her starship is shot down in Metroid: Zero Mission, not involving any type of beam on her part. The move seems to have been inspired by the Hypermode state, a state Samus could access while in a pile of Phazon. In both Metroid Prime and Metroid Prime 3: Corruption, this move was used as an attack method to defeat Metroid Prime and Dark Samus; it is strikingly similar to the Zero Laser, although, this beam actually consists of two beams intertwined and rapidly fires streams of Phazon beams instead of one massive beam. Rival bounty hunter Gandrayda can use a move nearly identical to the Zero Laser when mimicking Samus's form in Metroid Prime 3: Corruption, though due to the game's release date, this is likely a coincidence or a possible reference to Brawl instead. The Zero Laser may also have been inspired by the Hyper Beam, an extremely powerful attack used against Mother Brain at the end of Super Metroid, though their appearances differ, as well as the Hyper Beam having no known detrimental effects. Zero Laser trophy in Brawl. Zero Laser trophy in for Wii U. In Samus's Final Smash, she unleashes a huge laser beam from her Arm Cannon that draws opponents to the centre of the beam. Quite handy, since the closer they are to the centre, the more damage they'll take! You can also angle it up and down (albeit slowly), letting you catch more of your enemies and create more havoc. Samus getting ready to fire the Zero Laser. In Brawl, once the laser is finished, her Power suit pieces fall off of her. The pieces then become throwable items. Beginning to fire the move in Super Smash Bros. for Wii U. 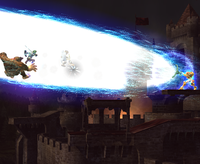 Zero Laser in Super Smash Bros. for Wii U.
Samus using Zero Laser as shown in a Skill Preview in Ultimate. Zero Suit Samus using Zero Laser as shown by a Skill Preview in Ultimate. Zooming in on the Zero Laser Trophy in SSB4, one can see Samus's helmet opens up at the top of her head, revealing the same black fabric used on other parts of the suit. This does not happen during gameplay. In the trailer for SSB4, the laser for Samus' is colored differently to how it is in the final game. Zero Suit's is one of two Final Smashes in Ultimate that involve a non-playable appearance by another playable character, along with Pair Up. However, unlike Pair Up, this is because Samus and Zero Suit Samus are the same individual. Zero Laser is one of two Final Smashes in Ultimate to share the same name as another, mechanically different Final Smash, the other being Critical Hit. Additionally, both versions of Zero Laser are used by two versions of the same person, much like Zelda's and Sheik's Light Arrow in Brawl and SSB4; however, both variants of Light Arrow were mechanically similar. This page was last edited on March 23, 2019, at 17:50.